Nice pattern, thank you so much! The earth without "art" is just "eh"
Hello and welcome to Hook & Ewe Boutique! I am so grateful you are here. My name is Teresa Ambrosino from Ohio and I am the owner and creator of Hook & Ewe Boutique. 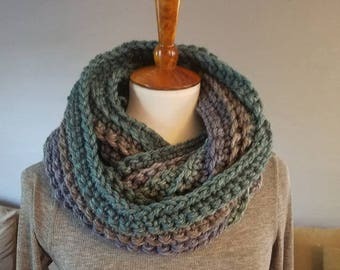 I started this boutique in Fall 2016 to "use up" my yarn stash and make a few pieces. I think my husband knew right then it was a bold faced lie that only I believed. Crochet is a skill, a craft, an art and my passion. I love to seek out patterns and explore the diversity of materials out there to create! So every single item you see was handmade by me! I have a combination of items that are finished, ready-to-ship or made-to-order. I am happy to offer items at wholesale cost and flat-rate shipping. Follow me on social media through Facebook, Instagram or Pinterest. You will find sneak peaks, deal and behind-the-scenes of Hook & Ewe! Hello! I am the yarn artist at Hook & Ewe. With a hook in my hand I create things, almost from magic, but really from pure passion. Welcome! My name is Teresa and I am Hook & Ewe. Some of you may notice my shop has been "remodeled." I have learned over the past few years to enjoy the journey, follow your heart and let life take you on an adventure! I have listened and followed my heart to open my shop back up and take it in a new direction. You will only see finished products in my shop. Designing and writing patterns took time away from my craft so now I enjoy finding patterns and showing off others incredibly hard work! I hope you enjoy what I have been able to create! If you have any questions please do not hesitate to contact me through Etsy Conversation. Please note the measurements and color for each item. If you are unsatisfied in any way please contact me within 5 days of receiving the item. Paypal is my preferred method of payment. Direct Checkout is now available from my shop. I do accept credit and debit cards, Etsy gift cards and other international payment methods. Most of my items are MADE-TO-ORDER. They will take 1-2 weeks for production and then will ship 2-3 business days after payment has been made. Some items will be READY to SHIP and will be designated so in the listing.. Shipment details are listed with each item and will be within 2-3 business days AFTER full payment has been made.